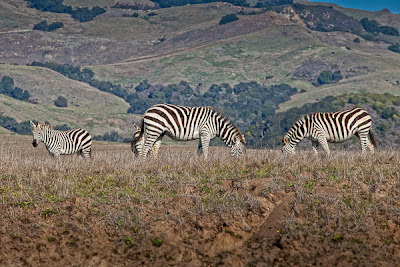 ELEPHANT SEALS, AND ZEBRAS, OH MY!! 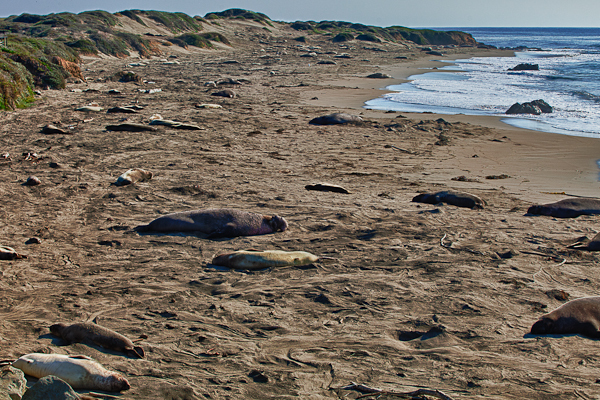 Every year thousands of Elephant Seals arrive at the Piedras Blancas beach in San Simeon to give birth and breed. 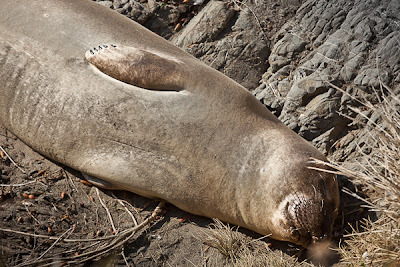 The males begin arriving in late November and the females in December, with the first birth usually happening somewhere between the 15th and the 20th. We have visited the Elephant seals on previous visits to the Central Coast but never in December and we were curious to see if any pups had been born yet. So we loaded ourselves and Mollie in the car and headed over to the coast for the afternoon. Highway 46 West is the most direct route to the coast from Paso Robles and is an absolutely beautiful drive. 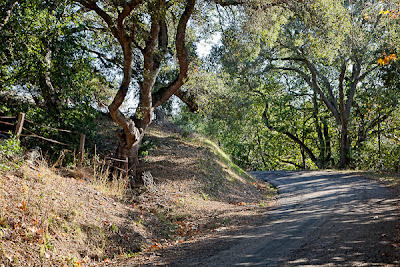 But most of the time when we head to the coast we take a detour and go the road less traveled route. 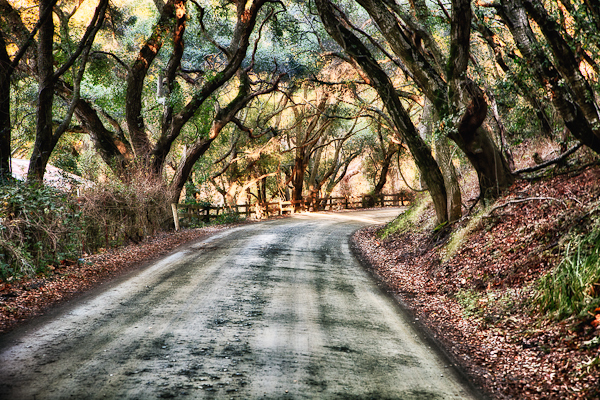 Driving on Santa Rosa Creek Road can take 2-3 times longer but we love the back roads and the scenery is breathtaking as the road climbs up and over the mountain range and down into the small coastal town of Cambria. 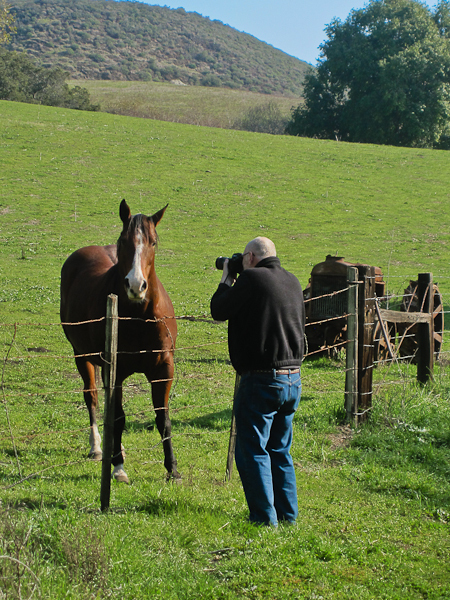 John stopped to photograph some old farm equipment and as he was taking the picture he heard some galloping in the distance. He looked up and was startled to realize that a horse was running directly towards him. He just wanted to say Hi! After driving through Cambria and getting onto Highway 1, we headed north where we were surprised to see this group of Zebras grazing along the fence. The beach had a few adult seals resting and basking in the sun but there were no baby seals yet. The docent I spoke with said that pups have been born as early as December 14th but they were still waiting for the first pup to be born this season. Thousands of pups are born here each year and by late January the beach will be covered with seals. 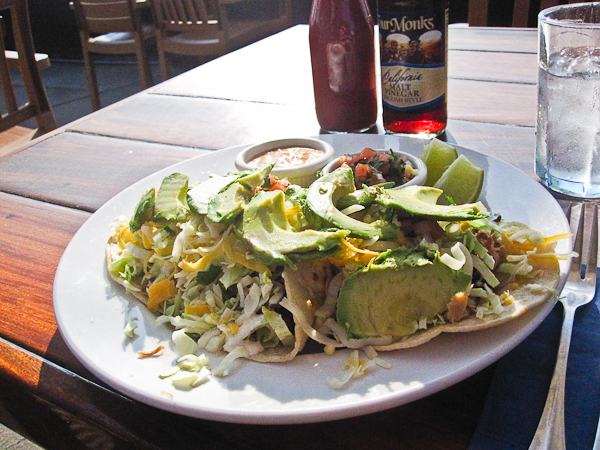 We stopped and had lunch at one of our favorite restaurants in this area, Moonstone Beach Grill. A fish and chips platter for John and carnitas tacos for me. 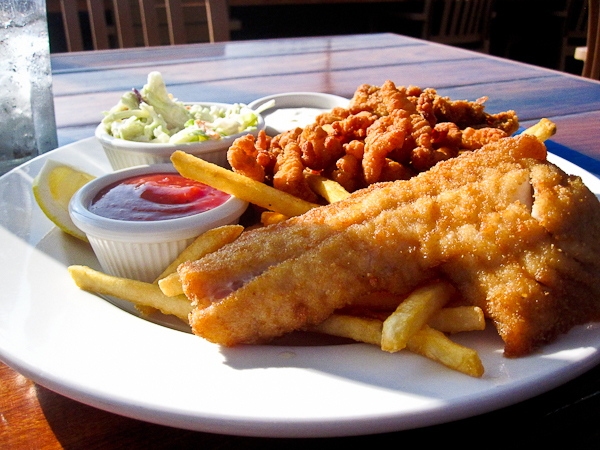 Delicious food and a priceless view! After a quick stop in Cambria for some coffee to go we made our way out of town and headed home. Highway 46 East is again the easiest and fastest route back to Paso Robles but we were still feeling adventurous, so after a few miles we detoured off of the highway onto the Old Canyon Road, headed south towards Whale Rock Reservoir, keeping an eye out for Santa Rita Road which heads east back towards town. Slow, one lane and at times unpaved, it is a feast for the eyes and the soul. We slowly drove along and at times going no faster than 15 mph, carefully watching for oncoming traffic. Of course on this road there isn't much traffic. 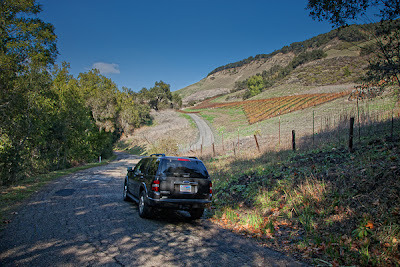 I think we only encountered 3 or 4 vehicles in the 11 miles of twisting, curvy roads. Fun! That's it for now. Thanks for stopping by. While John takes a blogging break, I thought I would jump in and let everyone know where we are and what we have been doing. A week ago we made the short drive from Salinas to just south of Paso Robles. Without question, this is one of our favorite areas to visit and explore. The area surrounded by rolling hills (or huggable hills as I like to call them), is about an hours drive from the ocean, and is smack dab in the middle of one of the best wine regions in the country. As new Elks members, we are able to stay at the local Elks rv park this year and this particular park has full hookups and 50 amp electric, which is definitely an added bonus. 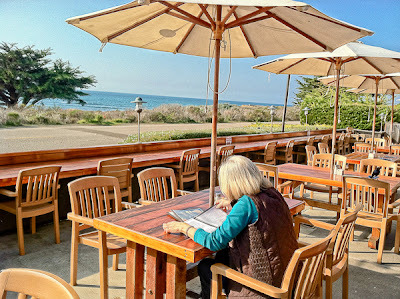 It has turned out to be a very convenient location for touring wineries and driving to the coast, and is just a few miles from one of our favorite stores, Trader Joes! In fact we like it here so much that we have extended our stay by another 5 nights. 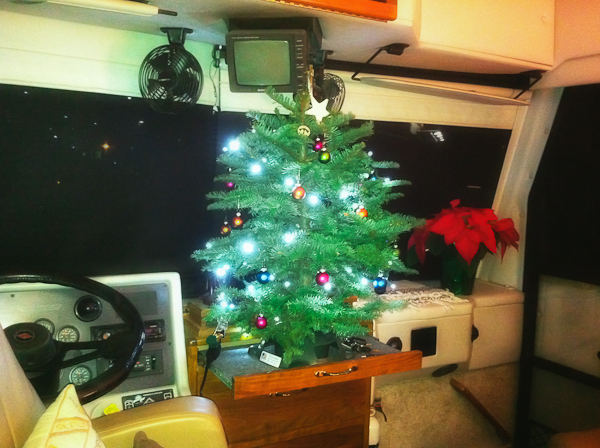 This past week we drove over to Lowes and found a small table top tree. With a string of lights and some inexpensive ornaments we now have a festive Christmas tree sitting in our front window. Yesterday and again today we took a break from wine tasting and exploring and just stayed close to home. I finished up a couple of knitting projects and we finished wrapping and packing gifts that we were mailing to family in Michigan. After the boxes were mailed and sent on their way, we did a little organizing and purging of the motor home and even managed to fill a box with a few items for the local thrift shop. We can now see most of the floor again! This evening was BBQ ribs night at the Lodge so we walked over there and enjoyed some wonderful, tender, Santa Maria style ribs served with pinquito beans and tossed salad. Ribs so good, they didn't need any sauce! !